Determines the language of the email body text and configurable to block certain languages. GFI MailEssentials takes a portion of the email body message and compares it to an in-built language engine. 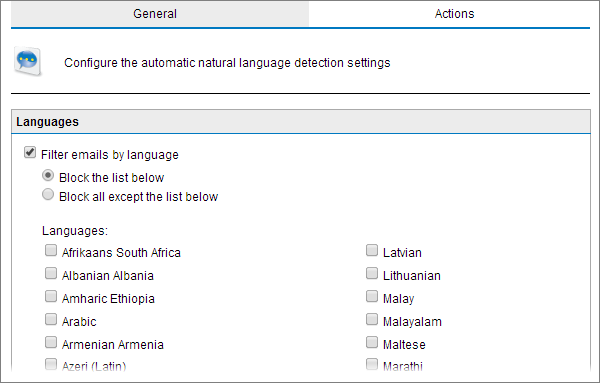 Configure the Language Detection filter to block certain languages or allow only some language. The Language Detection filter is different than the Header Checking - Language filter since it analyzes the language of the email body text. The Header Checking analyzes the encoding (character set) of the email header. Results of the Language Detection filtering engine are generally more reliable. The Language Detection filter is NOT enabled by default on installation. Go to Anti-Spam > Anti-Spam Filters > Language Detection. From the General tab, select/unselect Filter emails by language option to enable/disable Language Detection. Select Block the list below to select the languages to block or Block all except the list below to block all languages except the ones selected. Select the languages to block/allow from the Languages area. Click Actions tab to select the actions to perform on messages identified as spam. For more information refer to Spam Actions - What to do with spam emails.